Charlie Reche had been here since 1887, at which time the people living in the area were all Indians. Most of the information I gathered concerning the history of Giant Rock was from both the Indians and Charlie Reche. So I figure this information is right from the horse's mouth, so to speak, because they were the ones who were here before it became what it is now. According to the Indians, this was an Indian Holy Ground, where the north and south tribes met annually. The Chiefs held their seances and meetings close by the Big Rock, which they called the "Great Stone," because to them it symbolized the Great Spirit, as it was the largest single object in the area. 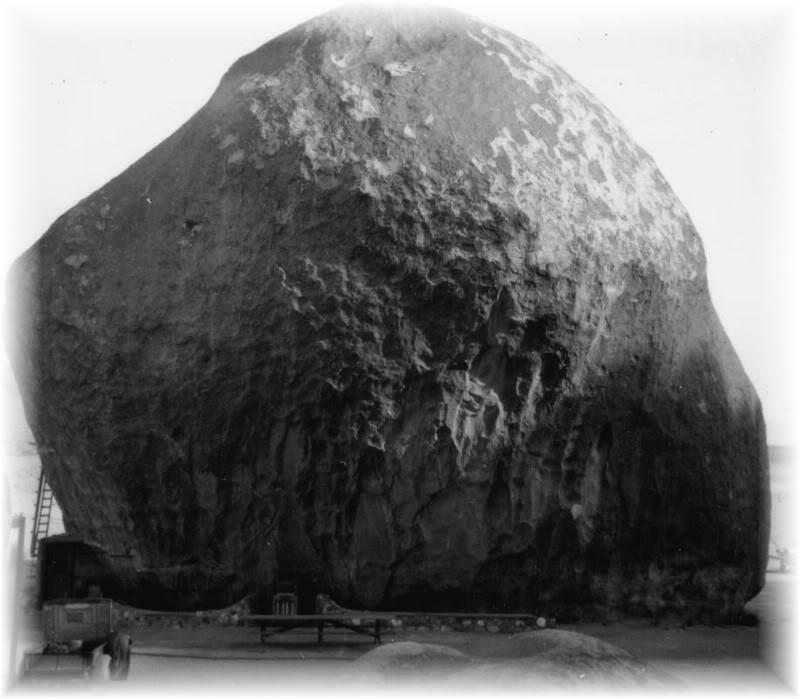 Today, it is still known as the largest single boulder in the world. The Indians assembled for their meetings here for up to three days at a time. During their meetings, none of the tribesmen were allowed close by as the meetings, per se, were actually a collection of the Chiefs and the VIPs in the tribe. The rest of the people in the tribe had to camp about a mile or so away so as not to be near the actual meeting place. I had the honor of being able to speak to the son of an Indian Chief. This man was ten years old when his father put a mark on the Giant Rock, on the north side. The Indians called this mark "the Sign of the Scorpion." To the Indian's understanding, this means a good place. Also, wherever an Indian Chief put a sign, no other Indian was allowed to put other signs. This being the reason for only the one sign on the big Rock. Whenever one finds an area where there are numerous Indian hieroglyphics on the rocks, this is an area where Indian children have been practicing the art. Charlie Reche, having homesteaded here in 1887, was allowed the privilege of meeting with the Indians many times. Reche's homestead included the area where the Integratron now stands, as well as several acres besides. In 1930, while I was still in Santa Monica, a very interesting person arrived at my uncle's garage. This fellow had taken up prospecting because he had been in a fishing fleet and also in the Merchant Marine, and as a result had acquired too much moisture in his lungs. Therefore, under doctor's orders, he had discontinued these activities where he had to be in fog and moisture all the time. He had a four cylinder Essex car which had a rod knocking in the engine and he had no money. My uncle, Glenn Paine, had his garage on 2nd Street, just off of Broadway in Santa Monica, across from the Carmel Hotel. He engaged mostly in the selling of overnight parking for the hotel inside his garage. He also did repair work and was a Buick specialist. When I came to California from Ohio, in 1930, to see my uncle, he needed someone to help him. So I stayed with him and that's how I happened to be there. This man I spoke of happened to be Frank Critzer. When he came into my uncle's garage, he was looking for someone to correct that rod knock in his Essex, who would do it without charge. Being interested in mining and having a period of lull during the depression, we just happened to have a little time on our hands when this fellow drove in with his Essex. So, that same day we took him to lunch with us. We discovered he was a very intelligent person and that he did know quite a lot about prospecting. Thus, in the course of getting acquainted we became instant buddies, so to speak. My uncle allowed him to sleep in the garage and we repaired his Essex. When Frank Critzer was ready to leave, we gave him $30.00, which was a lot of money in those days. We also stocked his car full of canned goods and headed him out. He told us that wherever he would settle down then he'd write to us, and also that we would be included in any mining claims he should happen to declare. A year went by before we finally heard from him. We had practically given up on him when we received a letter in which he had drawn a map showing how to get to Giant Rock. The following weekend my uncle and I went to Giant Rock to see him. Frank had already started to dig under the big Rock to make a place to live. Banning was the closest town in which one could purchase supplies for building, so Frank was getting by with what was there. Too, he had only squatter's rights and a mining claim on Giant Rock. He didn't own the property, for it was government land. By digging under the Rock he could have a place to live without having to purchase materials to amount to anything. Frank had shrewdness and comprehension, so he reasoned that if he dug a room under the north side of the Giant Rock, the boulder would take all summer getting warm and hold the warmth beneath it during the winter. By the same reasoning, the Rock would get cold during the winter and keep the room temperature cool during the summer. Thus there would be little need for heating or cooling. This would amount to six months' delayed thermal reaction. This has proved to be good engineering on Frank's part because the maximum temperature under the Rock is 80°F without any refrigeration in the summer time, and a minimum of 55°F in the winter time with no heating. The outside temperature will vary from approximately 25°F to 115°F. The Giant Rock covers 5800 sq. ft. of ground and is 7 stories high. The rooms dug out from beneath it amount to approximately 400 sq. ft., so one can readily see that this is a very small fraction of the total area of the bottom side. The only radio Frank Critzer had was one that Charlie Korell had given him. I spoke to Charlie later about this as he made frequent trips to Giant Rock. The radio was a little 3 dial, A & B dry battery Atwater Kent, with the tubes exposed and no case around it. It wasn't any good for transmitting messages to Germany, although it was a superhetrodyne receiver. The stories had generated from some people's erroneous thinking. Frank did have a German name. He had served in the German Navy as a mess boy on a German submarine in World War I. But he had come to our country, worked in our Merchant Marine, and was a naturalized citizen. Besides, he had no further affiliation with Germany whatsoever. But because he did have a big radio antenna on top of the mountain, some people assumed he was using his radio for spying purposes and, without first checking with the FBI, these people started the rumor that Frank surely must be a spy. Consequently, in August of 1942, three deputies came to Giant Rock, supposedly to take Frank in for questioning. I spent many weekends visiting with Frank at Giant Rock. Frank had a big kitchen table, and a big wood-burning cook stove, on which he prepared, cooked, and served German pancakes for anyone who happened to stop in. He usually had a case of two of dynamite and a partially opened case under the big kitchen table. We would put our feet on them when we were with him. He also had some caps, as he was doing some prospecting and dynamiting, and he knew how to use these things. When the three deputies came to take Frank in, the first thing he noticed was that they were from Riverside County. Giant Rock being in San Bernardino County and Frank being a man of principle, he knew they had no authority in this county and he told them so. According to Bill Royal, who had brought the deputies out here -- as they didn't even know where Giant Rock was, Frank, after a lot of arguing, said that if they were going to take him in anyway, that he needed to get his coat. When he went into his living quarters beneath Giant Rock to get his coat, he pulled the 2 x 4 bar, which he had across the door on the inside to hold it in place, and thus barricaded the door. The deputies immediately assumed Frank was defying them, so they lobbed a tear gas grenade in through the north side window. The unfortunate part of this whole incident was that the grenade landed underneath that table, thus setting off the caps and dynamite. The explosion killed Frank Critzer, blew the windows out, and injured the deputies. Newspapers ran the story that he was a German spy. I had personally talked with the FBI; they knew the newspaper stories were not true. Frank had written a manuscript called the "Glass Age" which he'd given to a friend to type. In 1936 he had already in print all of the plastics we use today, and some of which we do not have yet. He was an advanced thinker in his own right, with a brilliant mind. When I finally had the time from work to come to Giant Rock after reading about Frank's death in the newspapers, there was nothing left but the hole under the rock. All of Frank's belongings had been hauled away, including the 4 cylinder Essex. The place was literally stripped.